When I was pregnant with The Little, I went through a phase when I craved Horchata like a, well, pregnant woman. At the time, I made it using raw milk and would drink a pint every day and then it started giving me crazy heartburn and I moved on to another food obsession. Yesterday, during our Mother’s Day brunch, I was staring at the Little with a little bit of awe from what my body was able to help create and I remembered my Horchata binge drinking days and thought it was time to have another glass. 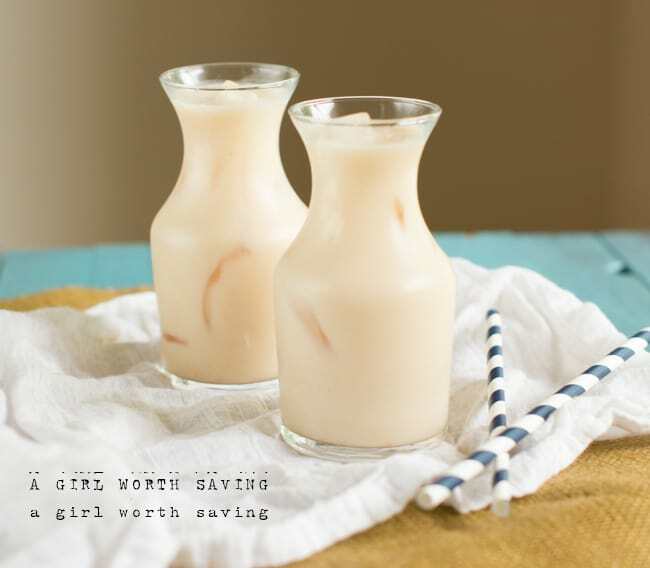 This Paleo Horchata recipe is so simple! I even drink it hot out of the pan. In your blender, add the coconut shreds, cinnamon powder, salt and maple syrup. Lastly add in your boiling water and blend for 1 minutes (in Blendtec on the soup setting) or 3 -4 minutes in a normal blender. Strain with a nut milk bag or fine strainer. Set in fridge to cool. You may notice that some fat gels at the top and you will want to remove this (use it in another dish). This is awesome over ice. Oh I like that this is not a lot of work to make! Marcie, I think we the only two people who have ever tried Horchata, lol. My family would love this. And love the pictures. I don’t think I have ever heard of a Horchata, but it looks good! I have never heard of this before. It sounds tasty though. I’ve never had horchata, but this sounds absolutely delicious! The first and only time I had horchata was when I was in Spanish class in college. You are definitely making me want to try it again! I’d never heard of this before but it sounds awesome! Beautiful photos! I would love to try it! Never once have I heard of it! I have a can of horchata in my fridge and still have drunk it yet – been months. Huh, I’ve never heard of this. I have never had this before but am now dying to try it! That’s pretty neato, I had no idea. Thanks for sharing and if you make it, I hope that you like it. I have never heard of Horchata but it looks good! I must try this, it sounds so amazing. One of my friends–from Mexico–owned a restaurant on NW23rd, and I loved his Horchata. I need to try your recipe because now I want some! I’ve never tried horchata before. I have never heard of horchata, but it sounds yummy! I have heard of Horchata … seen Horchata … but have never tasted it. It looks so pretty here! 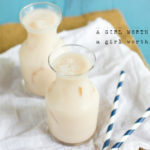 I’m not a huge fan of Horchata, but I may make this for my hubby because he likes it! Never heard of Horchata, but this looks good. This tastes fantastic! I think I’ll be serving it warm next time because the fat started to congeal after I cooled it with ice cubes which resulted in an unpleasant texture. I love (d) horchata, so I very much appreciate this adaptation. I added a shot of vanilla rum to one serving over ice, and this made a delicious cocktail. Thanks so much for the recipe. You are so welcome Abigail 🙂 I’m glad it worked for you. I also wanted to add that I saved the coconut that was strained out, and I later added it to a fruit salad I made for my daughter- just stirred it right in with some strawberries, banana, pear, etc. It was delicious! That is just plain brilliant!!! Seriously love this tip. I am literally going to run out to the store so I can try this tonight! I hope you like it 🙂 It’s one of my favorites. I love horchata, so so yummy. Nice to have a recipe to make at home. I adore horchata!!!! Can’t wait to try this – thanks for posting! Coconut shreds… The same as shredded coconut?? I love this horchata! So good! This may be a very silly question, but what kind of drinking glasses are those in your picture of the horchata? They are adorable, but I can’t find them anywhere. I’m so glad you liked it Krytal. I got them at Pier 1 during the summer.